Research has shown that there are over 770,000 children with special educational needs in the UK. Many of those don’t have access to the correct or appropriate playground, but at Playscape Engineering we know just how important proper outdoor play solutions are to SEN children. They not only help their physical, social and emotional development, they also offer unique opportunities for adventure, challenge and personal development. SEN pupils in particular will benefit from exploring the variety of sights, smells, textures and sounds found in natural environments and in our play solutions. In fact, the exploration and experiences that take place in our outdoor playgrounds can enhance SEN pupils’ overall health, happiness and wellbeing as they explore boundaries and engage with the unfamiliar or unexpected, gaining confidence along the way. 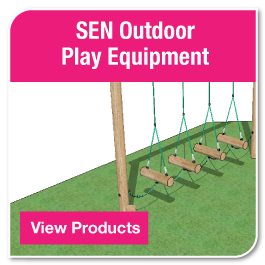 Playscape Engineering understands the needs of SEN children. We provide the perfect play solutions to encourage SEN pupils’ learning and growth – from products that encourage social interaction between children to products that improve mobility, special awareness and coordination. Through a detailed consultation, and using our vast experience in this field, we will develop an outdoor playground full of exciting challenges – designed to encourage pupils’ growth. We’ll also be on hand to offer advice and suggestions as well as maintain your playground solution long-term.